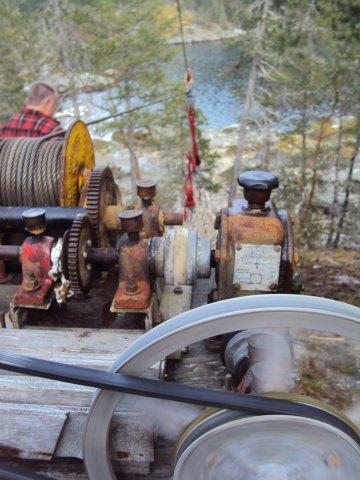 A year ago last Christmas I saw an ad for ‘an old boat-haul winch’. It was in Victoria. I called the guy and we did the deal over the phone (and I mailed a cheque). He said, “I’m going out but I’ll leave it in the garage/carport. When you come over just take it. It will be under wraps”. We drove over after visiting my brother for Christmas (it was late), pulled down the empty-but-snow-covered driveway and found the carport. Ben and I lifted this ugly, rusting contraption consisting of an old winch, cable, a series of gears and shafts and a 1/3hp electric motor into the back of the Pathfinder. It weighed a ton or about 250 pounds without the hyperbole. Man, it was a ‘contraption’! I can’t honestly say it was well received by anyone at the time. Not even me. Sally was definitely not amused! There is something singularly unappealing about heavy, greasy, rusty ‘junk’ sitting in the back of a carport under a tarp in the dark (on Christmas eve). Ya know? That day came a few days ago due to the failure of my other winch and the process of ‘figuring it out’ and ‘making it work’ just finished today. This old, home-made ‘contraption’ works like a hot dam! Yes, it is a bit slow at only 6 feet per minute (meaning: it takes 20 minutes to haul a log up the hill vs the 6 or seven minutes the old winch took) but this one is electric, it is quiet and it is a lot stronger. Wa-bloody-hoo! John came over and marveled at it. He helped figure it out and ‘made it go’. “Geez, the old geezer (it just has to be an old geezer) was some kind of genius, eh? I mean, look at that junk! 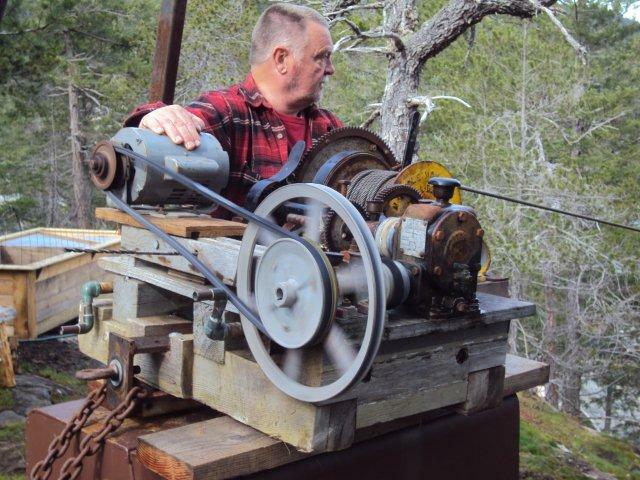 He used a pulley off an old washing machine, made handles out of old pipes, lined it all up on a home-made wooden, adjustable frame and it works as good today as it did when he cobbled it together at least 60 years ago.” (it has to be that old at least, maybe older). We tried it out and it pulled up a couple of logs without breaking a sweat! There must be something ‘wrong’ with a guy who gets that much pleasure from making old junk he found in scrapyards and carports and garage sales work. Some kind of retarded childhood development thing, I guess. Mind you, the Wférs leave tomorrow so the timing is still bad but you know, it still feels good.